Like thunder, like the rain at noon. To the mouths of mortal wrongs. I come gently like the evening rain. Wie Donner, wie der Mittagsregen. Sacht komme ich wie der Regen am Abend. 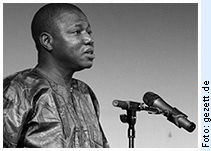 Remi Raji is the pen name of Aderemi Raji-Oyelade, a Nigerian poet, scholar, literary organiser and cultural activist. Raji’s first collection of poems – A Harvest of Laughters (1997) – has won national and international recognition. A Salzburg Fellow and visiting professor and writer to a number of institutions including Southern Illinois University at Edwardsville, Universities of California at Riverside and Irvine (all U.S.A.), University of Cape Town (South Africa), and Cambridge University (UK), Raji’s scholarly essays have appeared in journals including Research in African Literatures and African Literature Today. Raji has presented his poems in Africa, Europe and America. In 2005, he served as the Guest Writer to the City of Stockholm (Sweden). Raji’s works have been translated into French, German, Catalan, Swedish, Ukrainian and Latvian. He has been an “Alexander von Humboldt”-Scholar to the Humboldt University to Berlin (Germany). Raji currently teaches Literature and Creative Writing at the Department of English of the University of Ibadan (Nigeria).